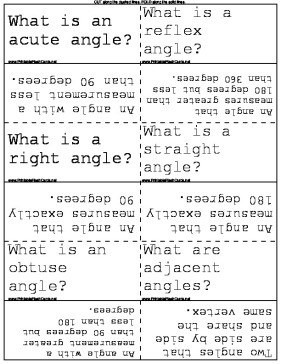 What is an acute angle? An angle with a measurement less than 90 degrees. What is a reflex angle? An angle that measures greater than 180 degrees but less than 360 degrees. What is a right angle? An angle that measures exactly 90 degrees. What is a straight angle? An angle that measures exactly 180 degrees. What is an obtuse angle? An angle with a measurement greater than 90 degrees but less than 180 degrees. What are adjacent angles? Two angles that are side by side and share the same vertex. What are complementary angles? Two angles whose measurements add up to 90 degrees. What are Supplementary angles? Two angles whose measurements add up to 180 degrees. What are Corresponding Angles? What letter do they create> Two angles that are equal on parallel lines. They create an F.
What are Co-Interior Angles? What letter do they create? Two angles on parallel lines that add up to 180 degrees. They form the letter C.
What are alternate angles? What letter do they form? Two angles on parallel lines that are equal in measurement. They form the letter Z. What is the perimeter? It is the sum of the lengths of all sides of a figure.